Here's another in-depth look at one of the new features in Prosper202 1.7. 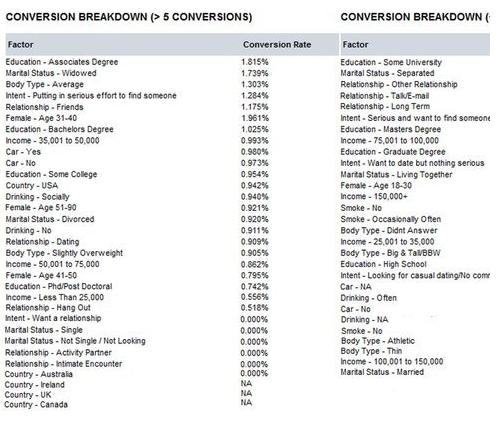 Let's say you are running a campaign with Plentyoffish and want to make use of their awesome demographic data they provide in their conversion reports. 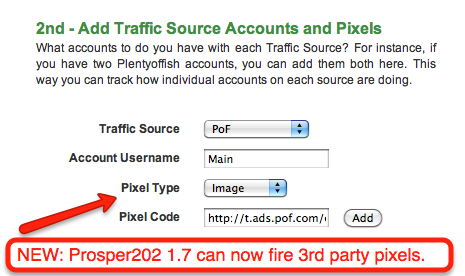 That's cool and all, but up until now you had to choose between the pof pixel and the prosper202 pixel. That's because a lot of networks only allow you to place one pixel per offer. Prosper202 1.7 To The Rescue... Again! Now repeat this for all the traffic sources with pixels then you are set. The only step left now is to grab your code for the Universal Smart Pixel (USP). What make it so smart? Glad you asked. The prosper202 USP can actually intelligently determine the traffic source that generated the conversion in real time and select the correct pixel for the traffics source to attribute the conversion to. This means that the page is not going to try load 10+ pixels in the hopes that one of the will fire. This is a huge performance increase and will ensure that your pixel loads before your leads leaves the conversion page. Unfired pixels are a major cause of inaccurate data and missed conversion information. Retargeting seems to be all the rage these days, and it with good reason. When done right, retargeting can boost ROI considerably. At this point, Prosper202 won't automatically place your retargeting pixels on your landing pages, soon it will, but it can be used to place a burn pixel for converted audience segments or automatically place them into a new converted segment. The possibilities are quite extensive. So get your thinking caps on, and Prosper!